UPDATE: D50 wird es nicht als Plugout für das System 8 geben sondern „nur“ als Plugin. UPDATE: the D50 will not be available as a Plugout for System 8, so it’s „only“ a Plugin. sorry, but no. But the JX03/ JX3P may still be coming to the System 8. 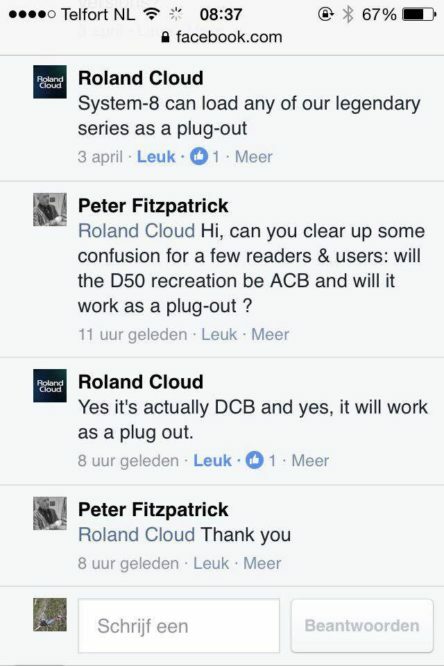 Roland seems to put a lot of effort into their Cloud Synths – one of them being the newly announced D50 which contains 2 Layers of a classic Synth with Ringmod and short Samples – that made it famous in 1987. They also ported the Jupiter 8 and Juno from the System 8 and Boutique Series (JP08 JU06 – not the JX btw so far) into the cloud. So it sounds a lot like they quit to work on the System 8 or Plugout Synths – for the future – I just hope for a Microkorg –JdXi shaped one with System 1m’ish knobs..
anyway – they say they’d be working on the System 8 so the D50 will do as well as any Cloud synths should..
I’d not expect it to run on System1 /1m since it’s polyphonic and may need the power of the big one or is just set to work on it – anyway. it is good news. anyway – I will believe it when it is actually there. since multistage envelopes and stuff do not really apply best to the System 8 layout. here’s what was posted. totally nice. should be available on friday. hope so for the System 8 version which is basically „the same“. but don’t know how they might roll out everything. Yes, I was disappointed to read their subsequent update. but thank you for asking them – seems they do not put the D50 into the System 8, but the JX could still be in as well as new synths – maybe only those that do not contain samples. I’d really like to see „VARIATION“ applied to the System 100 to really access LFO 2 and Sample & Hold via Variation 2 und 3 thats easy to do but isn’t possible – since those parameters are not assignable to MIDI Controllers it’s not even possible to change it without the Software – so – this is my biggest wish before they finally decide to hard-code those small „samples“ into the System 8 to make that D50 become alive. Maybe hard to set those multi stage envelopes on the S8 as well..?